What it fails to mention is the impressive quantity of glorious CF-100 action sequences. Canucks on the flight line, Canucks taking off, Canucks firing air to air rockets, Canucks in formation with other Canucks. From the point of view of a CF-100 fan, it’s a masterpiece. There’s even a brief aerial shot of a Vickers Valiant for bomber fans. From a strictly cinematic viewpoint it must be admitted that its age is showing. The style of the film with its wooden ‘acting’ and patriotic theme is in keeping with its generation. That is some ways what makes it so interesting, it’s a time capsule from the past. The attitudes, not to mention the technology, are those of a bygone era, but it is still possible to find things to admire in those long ago attitudes. 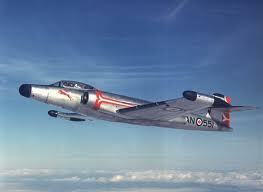 What is also of interest is a description of pre-NORAD (established 12 May 1958) Canadian air defences. It’s fascinating to see the size of organization and amount of equipment a sovereign nation felt was necessary to guard its airspace in the 1950’s. It reminds one of how fortunate it is that we live in more enlightened times. For those interested in the formative years of the cold war and the Canadian aircraft that figured so prominently in it this movie is highly recommended. They can also check out Birth of a Giant from the same source.